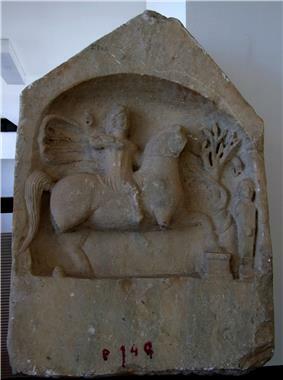 The cult of the "Thracian horseman" spread over much of the Balkans during the Roman period. Paleo-Balkan mythology includes the religious practices of the Dacians, Thracians, and Illyrians. Little is known about the rituals and mythology of the Iron Age Balkans, but some of their gods are depicted in statuary or described in Greek sources. One notable cult, attested from Thrace to Moesia and Scythia Minor, is that of the "Thracian horseman", also known as the "Thracian Heros", at Odessos (Varna) attested by a Thracian name as Heros Karabazmos, a god of the underworld usually depicted on funeral statues as a horseman slaying a beast with a spear. 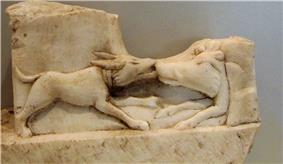 A hound attacking a boar, a scene depicted on the lower half of many "Thracian horseman" reliefs. Zibelthiurdos (also "Zbelsurdos", "Zibelthurdos"): a god recognized as similar to the Greek Zeus as a wielder of lightning and thunderbolts. Kotys ("Cotys", "Cotto", "Cottyto", "Cottytus"), a goddess worshipped with much revelry by Thracian tribes such as the Old Norse Höðr "war, slaughter". Bendis was a Thracian goddess of the moon and the hunt whom the Greeks identified with Artemis, and hence with the other two aspects of formerly Minoan goddesses, Hecate and Persephone. Semele is probably the Mother Earth goddess akin to Lithuanian Zemyna and Latvian Semes, both of which are 'Mother Earth' goddesses. Likely there has been an early Semele Goddess in proto-Slavic mythology as 'earth' to this day is "земля" (semlya) in Russian and "земя" (zemya) in Bulgarian. Also compare Phrygian 'Zemelo'. Zalmoxis, identified by some with the thunder-god Gebeleïzis, an important god of the Dacians and Thracians. Derzelas (also "Darzalas") was a chthonic god of health and human spirit's vitality. Kogaionon was the name of a holy mountain of the Dacians. The mythology of the Illyrians is only known through mention of Illyrian deities on Roman period monuments, some with interpretatio Romana. There appears to be no single most prominent Illyrian god and there would have been much variation between individual Illyrian tribes. The Illyrians did not develop a uniform cosmology on which to center their religious practices. Some deities are known exclusively from Istria, such as Eia, Malesocus, Boria and Iria. In Liburnia, Anzotica is identified with Venus. Other local theonyms include Latra, Sentona and Ica. Bindus, identified with Neptune, was worshipped among the Japodes. Further north, the hot springs of Topusko were dedicated to Vidasus and Thana, identified with Silvanus and Diana. From the eastern Balkans, the cult of the Thracian horseman spread to Illyria during the early centuries CE. The god Medaurus mentioned in a dedication at Lambaesis in Africa by a Roman senator and native of Risinium appears to be identical to the horseman, being described as riding on horseback and carrying a lance. The Delmatae had Armatus as a god of war. The god En was also worshipped by Illyrians. En was demoted to demonic status following the arrival of Christianity in Illyria, and continues to be used in the Albanian language to refer to Thursday (). ^ Also cognate: Irish cath "war, battle", early German Hader "quarrel", Greek kótos "hatred", Old Church Slavonic kotora "fight, brawl", Sanskrit śatru "enemy, nemesis", and Hittite kattu "spiteful". See Orel, Vladimir. A Handbook of Germanic Etymology. Leiden, Netherlands: Brill, 2003: 165. ^ Hdt. 4.94, Their belief in their immortality is as follows: they believe that they do not die, but that one who perishes goes to the deity Salmoxis, or Gebeleïzis, as some of them call him. ^ Wilkes, J.J. The Illyrians, 1992, p. 245, ISBN 0-631-19807-5. "...Illyrian deities are named on monuments of the Roman era, some in equation with gods of the classical pantheon (see figure 34)." ^ Wilkes. "Unlike Celts, Dacians, Thracians or Scythians, there is no indication that Illyrians developed a uniform cosmology on which their religious practice was centred. An etymology of the Illyrian name linked with serpent would, if it is true, fit with the many representations of..."
^ Wilkes. "...dominant Illyrian deity and some were evidently worshipped only in particular regions. Thus several deities occur only in Istria, including Eia, Malesocus, Boria and Iria. Anzotica was the Liburnian Venus and appears in the traditional image of the classical goddess." ^ Wilkes. "Other local deities were Latra, Sentona and the nymph Ica, praying in relief sculpture), Knez 1974 (ritual vessel), Baçe 1984 (temple architecture in Illyrian Albania)." ^ Wilkes. "...including altars dedicated by chiefs of the Japodes at the shrine of Bindus Neptunus at a spring near Bihaé (see figure 30). The first reported contact between Japodes and Romans occurred..."
^ Wilkes. "North of the Japodes, the altars to Vidasus and Thana dedicated at the hot springs of Topusko reveal the local Roman Illyrians..."
^ Wilkes. "...identities of Silvanus and Diana, a familiar combination on many dedications in the territory of the Delmatae." ^ Wilkes. "...the short cloak streaming out behind. The Illyrian town Rhizon (Risinium) on the Gulf of Kotor had its protective deity Medaurus..."
^ Wilkes. "...Armatus at Delminium (Duvno) who was evidently a war god of the Delmatae, and the Latin Liber who appears with the..."
^ a b Lurker, Manfred. The Routledge Dictionary of Gods and Goddesses, Devils and Demons, Taylor & Francis e-Library, 2005. p. 57. Wilkes, John. The Illyrians. Blackwell, 1992. Tacheva, Margarita. Eastern Cults in Moesia Inferior and Thracia (5th Century BC-4th Century AD), 1983, ISBN 90-04-06884-8.